If you have kids, you have no doubt seen the slime making videos on YouTube and Pinterest. Kids everywhere are asking moms and dads to help them make slime. Most of those slime recipes are easy and require the use of glue, which makes a sticky mess, or borax powder, which can be hard to find and somewhat expensive. This article will teach you how to make super glossy slime with only a few materials. This super glossy slime can be made clear, or it can be colored with liquid food coloring drops. For even more bling you can add glitter. Here are the instructions on how to make your own glossy slime. Clear hair gel is available in most retail stores. Make sure you get a clear one. Baking soda is available at the grocery store with the baking supplies. Saline solution for contact lenses can be purchased at any pharmacy and some retail stores. Step 1: Pour the glue and hair gel into your bowl. Then add the hot water. Stir gently until the gel completely dissolves into the water. Step 2: Stir until you get a smooth consistency with no bubbles. Step 3: Using the second bowl, dump the baking soda into the bowl. Add the contact lens solution and stir until the baking soda completely dissolves and the mixture looks clear. Step 4: After the hot water/hair gel/glue mixture has cooled, add the baking soda mixture to the bowl. Step 5: Stir gently, but keep stirring until the mixtures are totally combined. Step 6: Keep stirring until the mixture starts to thicken up and form a glob. It should become thick and elastic. Step 7: Once it has thickened into a stiff glob, take it out of the bowl and knead it with your hands until it is smooth and pliable. Your finished slime should be clear and shiny. If you would prefer to have glossy, colored slime add a few drops of liquid food coloring and knead until it is well blended. You can add some glitter to your clear slime to really make it shine. If you want to get really fancy, add a little bit of color and one or two colors of glitter. 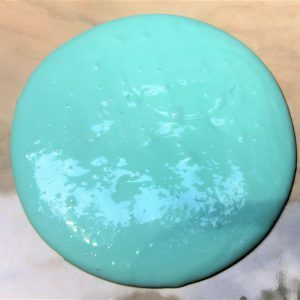 This glossy slime is easy to use and will last a long time if you store it in a Ziploc bag or tightly sealing the container. You should get many hours of fun out of it. If it starts to stiffen up or lose its elasticity, try adding a few more drops of hot water and kneading it again. Use it as party favors or friendship gifts. Make a bunch of colors and share with your friends. Display it in a clear glass jar on your windowsill. The light rays shining through it will make it really shimmery. This did not work! I had a very disappointed little girl. BOO!